A dragon on a temple roof in Taipei, Taiwan. Barbara O'Brien is a Zen Buddhist practitioner who studied at Zen Mountain Monastery. She is the author of "Rethinking Religion" and has covered religion for The Guardian, Tricycle.org, and other outlets. Buddhism came to China from India almost two millennia ago. As Buddhism spread in China, it adapted to Chinese culture. Monks stopped wearing the traditional saffron robes and adopted Chinese-style robes, for example. And in China, Buddhism met dragons. 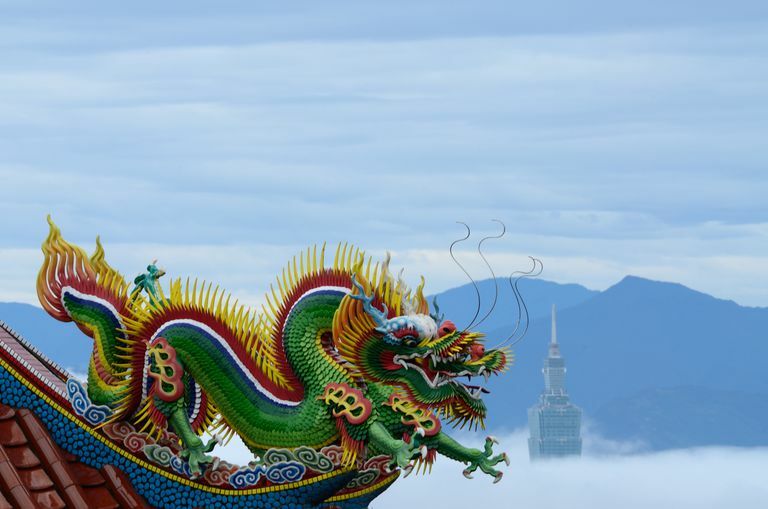 Dragons have been part of Chinese culture for at least 7,000 years. In China, dragons have long symbolized power, creativity, heaven, and good fortune. They are thought to have authority over bodies of water, rain, floods, and storms. In time, Chinese Buddhist artists adopted the dragon as a symbol of enlightenment. Today dragons decorate roofs and gates of temples, both as guardians and to symbolize the dragon's power of clarity. Buddhist dragons often are depicted holding a mani jewel, which represents the Buddha's teaching. In the 6th century, Chan (Zen) emerged in China as a distinctive school of Buddhism. Chan was nurtured in Chinese culture, and dragons make frequent appearances in Chan literature. The dragon plays many roles—as a symbol of enlightenment and also as a symbol for ourselves. For example, "meeting the dragon in the cave" is a metaphor for confronting one's own deepest fears and obstacles. Yeh Kung-tzu was a man who loved dragons. He studied dragon lore and decorated his home with paintings and statues of dragons. He would talk on and on about dragons to anyone who would listen. One day a dragon heard about Yeh Kung-tzu and thought, how lovely that this man appreciates us. It would surely make him happy to meet a true dragon. The kindly dragon flew to Yeh Kung-tzu's house and went inside, to find Yeh Kung-tzu asleep. Then Yeh Kung-tzu woke up and saw the dragon coiled by his bed, its scales and teeth glittering in the moonlight. And Yeh Kung-tzu screamed in terror. Before the dragon could introduce himself, Yeh Kung-tzu grabbed a sword and lunged at the dragon. The dragon flew away. Many generations of Chan and Zen teachers, including Dogen, have mentioned the true dragon story in their teachings. For example, Dogen wrote in Funkanzazengi, "I beseech you, noble friends in learning through experience, do not become so accustomed to images that you are dismayed by the true dragon." As an allegory, the story can be interpreted many ways. It could be an allegory for someone who has an intellectual interest in Buddhism and reads lots of books about it, but who doesn't feel a need to practice, find a teacher, or take the refuges. Such a person prefers a kind of faux Buddhism to the real thing. Or, it might refer to being afraid to let go of self-clinging in order to realize enlightenment. Nagas are snake-like creatures that appear in the Pali Canon. They are sometimes identified as dragons, but they have a slightly different origin. Naga is the Sanskrit word for cobra. In ancient Indian art, nagas are depicted as human from the waist up and snakes from the waist down. They also sometimes appear as giant cobras. In some Hindu and Buddhist literature, they can change appearance from human to snake. In The Mahabharata, a Hindu epic poem, nagas are depicted as mostly villainous creatures bent on harming others. In the poem, the enemy of nagas is the great eagle-king Garuda. In the Pali Canon, nagas are treated more sympathetically, but they remain eternally at war with garudas, except for a brief truce negotiated by the Buddha. In time, nagas came to be depicted as guardians of Mount Meru and also of the Buddha. Nagas play an important role in Mahayana mythology as protectors of the sutras. You may find pictures of the Buddha or other sages sitting under the canopy of a great cobra's hood; this would be a naga. As Buddhism spread through China and on to Japan and Korea, nagas came to be identified as a kind of dragon. Some stories told in China and Japan about dragons originated as stories about nagas. In Tibetan Buddhist mythology, however, dragons and nagas are distinctively different creatures. In Tibet, nagas usually are nasty water-dwelling spirits that cause disease and misfortune. But Tibetan dragons are protectors of Buddhism whose thunderous voices awaken us from delusion. What Was the Lost Buddhist Kingdom of Gandhara? What Are the Eight Auspicious Symbols of Buddhism? What Do They Mean? What Are the Buddhist Councils?